The 28.7 metre motor yacht Blinder, listed for sale by Cameron Bray at Northrop & Johnson, has seen a price reduction of AU$750,000. Built in GRP by UK yard Sunseeker International,Blinder was delivered in 2005 as a Sunseeker 94 model and has had several refits and upgrades since. Accommodation is for up to 10 guests in four cabins comprising a full-beam master suite, VIP suite and port and starboard twins, each with Pullman berths. All cabins have entertainment centres, LCD flatscreen televisions and en-suite bathroom facilities. 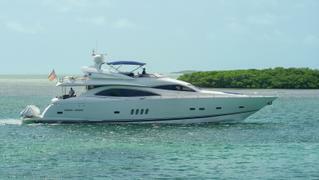 There are also quarters for three crew aboard this yacht for sale. A large open-plan saloon features comfortable seating on a settee and armchairs facing an entertainment centre including a 37-inch flatscreen LCD television and a stereo surround sound system. Forward is a formal dining area seating eight guests with a sideboard storing glassware, china and silver, and a full wet bar incorporating a fridge and ice maker. The aft deck is well equipped for al fresco entertaining, offering upholstered bench seating and a teak dining table with folding leaves, while up on the flybridge two tables seat eight guests. There is also a Jacuzzi and a wet bar with a fridge, ice maker and barbecue grill fitted on this level. Twin 1,652hp Caterpillar engines give her a cruising speed of 24 knots and she is fitted with bow and stern thrusters. Lying in Queensland, Australia, Blinder is now asking AU$2,990,000.